In terms of pronunciation, these are some of the numerous English words that can embarrass any second learner of the language maybe because there is no connection between their spellings and pronunciations. As a result, this article, with the use homophonic words, teaches second learners of the language how to pronounce these words correctly. Ewe is the name of a female sheep, especially when fully mature. This word is pronounced the same as "you". 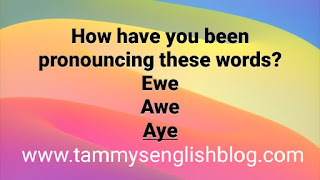 In other words, "you" and "ewe" are homophones, that is, they are pronounced the same way but differ in meaning and spelling. It is phonetically transcribed as /ju:/ which is the exact transcription of the word, you. Having its phonetic transcription as /ᴐ:/, awe is pronounced the same as "or". 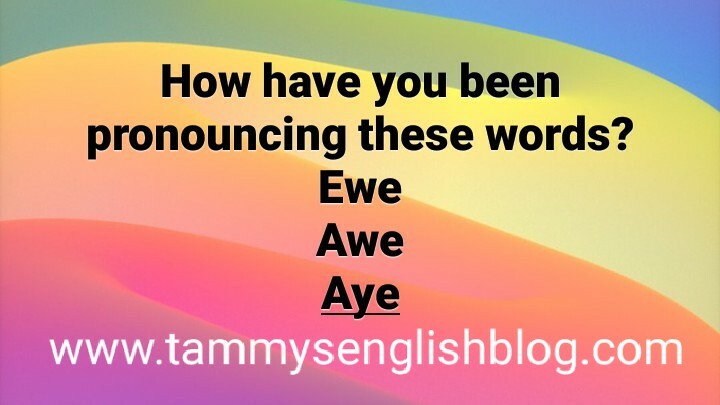 If you are in support of Tammy's online English tutorials, say aye! And if you are not, say nay! Lol! At least this should give you an idea as regards the pronunciation of this word. Aye is an affirmative answer, especially in voting. Aye means yes whereas nay means no. This word is pronounced the same as “eye” and “I”. Like “eye” and “I”, aye is phonetically transcribed as /aɪ/. This means that these words (eye, I and aye) are homophones.